The two-day, family-friendly gathering, presented by Unity Earth, will present live music, workshops, panels, dancing, drumming, yoga, forest walks and meditation. It will take place at the North Byron Parklands, a 660-acre venue, about 20 minutes from Byron Bay’s town centre. The event is an alcohol- and drug-free community event, and there is no camping onsite. You may obtain tickets for Fields of Healing for a price of $207 for adults and $165 for senior or student. The pass will give you access to the event for both days, including all performances and workshops. There also are tickets available for each day if you can’t make both days, or just want to attend for certain workshops and do something else in Byron Bay the other day. Tickets for one day are $120 for Saturday and $95 for Sunday (adults). Kids 15 and under are free to enter and do not need a ticket. Hereditary Dakota Chief and Global Unity Activist Chief Phil Lane Jr. In addition, the event commemorates the one-year anniversary of the “Return to Country of Mungo Man.” The ancient remains of a 42,000-year-old human were returned last year to his country in the Willandra Lakes Region of NSW. Members of the three Indigenous groups associated with Lake Mungo will attend Fields of Healing. Fields of Healing will feature a ton of options for you to attend while you’re here over the two days. Check out the full schedule here, but here are some highlights. In addition to all the workshops, performances and speakers, there will be what’s called “Healing Pods,” which will offer both free (Saturday) and paid (Sunday) sessions with massage, kinesiology and other practitioners. A short 30-minute drive from the Parklands, Broken Head Holiday Park would make an excellent choice for your accommodation over the Fields of Healing weekend. One of the main reasons is due to the fact that you’ll continue your healing by enjoying a holiday close to nature. Our campground is located steps away from a beautiful beach as well as walking trails. What a perfect setting to continue your personal reflections? In addition, we offer reasonable pricing on our campsites and beach cabins so we can fit into your travel budget easily. So if this new festival sounds right up your alley, then what are you waiting for? 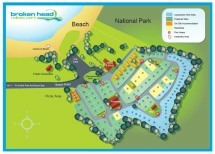 Choose the accommodation that’s right for you at Broken Head Holiday Park, and make a booking now!